In 1889 8th Avenue above 23rd Street had become a neighborhood of commercial structures and small hotels. That year a six-story structure was constructed at Nos. 539-541 8th Avenue, stretching back along 37th Street. Clad in light-colored brick and trimmed in terra cotta and brownstone, its arches and decorative touches reflected the highly-popular Romanesque Revival style. Rough-cut brownstone lintels at the second floor contrasted with the manicured terra cotta wavecrest bands just below them. Handsome paired plaques announced “ERECTED” and “1889” on both the 37th Street and 8th Avenue facades. Above it all was an ornate, paneled cornice with attractive rosettes. But grabbing the most attention were the fearsome demons that appeared throughout the design. Large, gruesome horned heads support pilasters along the second story, smaller snarling demons appear in the terra cotta panels below fourth floor openings and again at the top story. Titled “The Policy King,” by the newspapers, Adams made a fortune on the illegal gambling game “policy” which mostly targeted the poor and desperate. The Sun called Adams “the meanest man in New York” and said “policy as Al Adams has conducted it has been a form of larceny so mean that those engaged in it are held in a kind of contempt by other gamblers. Adams used his ill-gained fortune to purchase and develop real estate, like the new building at Nos. 539-541 8th Avenue. The upper floors, accessed at No. 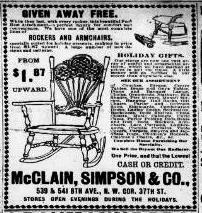 301 West 37th Street, served as a residential hotel while the ground floor retail space was taken by the newly-formed furniture dealers McClain, Simpson & Co.
An advertisement in The World in 1894 featured a rocker for $1.87 -- copyright expired. Not realizing he was being watched by assistant sexton Oscar Willing, Flemming tried to break into the poor box, using a screwdriver from his pocket. When he was unsuccessful he left, only to be followed by Willing who turned him over to a policeman. 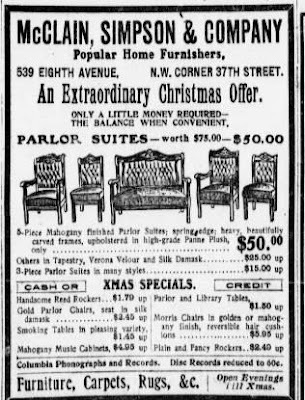 The problem was that Lawrence Adams was not really interested in selling furniture. The store managed, but only with Al Adams’ financial help. Then in October 1906 the Policy King committed suicide. Without the inflow of Al’s money, the store went downhill fast. On May 1, 1907 The Sun reported on the petition in bankruptcy that was filed “against Al Adam’s son, Lawrence P. Adams.” Even now Al Adams stole the spotlight. Lawrence took the $66,000 he inherited from his father and disappeared—destined to be not even a footnote in New York history. On May 10, 1911 the executors of Albert J. Adams’ estate auctioned off the numerous real estate holdings he had accumulated over the years, most of which were corner properties. Included in these was the building at 8th Avenue and 37th Street. The residential space upstairs would not last much longer. On February 12, 1919 the Imperial Dyewood Company leased 3,000 square feet as loft space. Then, with the city in the stranglehold of the Great Depression and the garment district taking over this section of Manhattan, the building was converted to offices, showrooms and factory space in 1935. During the second half of the 20th century the neighborhood declined. Along with the garment firms, tiny businesses carved spaces along the sidewalk level of 8th Avenue—some of them a bit sleazy. Nos. 539-541 lost its street level façade which was replaced by garish storefronts. But above the mishmash of awnings and shops, and partially hidden by gigantic four-story high advertising, Albert Adams’ demon-encrusted building survives. hmmm. I haven't missed a day. Wonder why you're not getting updated. Hi Tom - I'm getting the updates in my Google Feed Reader - so there may have been a delay there. I see 4 new posts there now that I will check out. Keep up the AWESOME work. I'll have to get a must-see list from you sometime as I want to bring my wife to NYC soon from VT for a weekend or weekday overnight date. There was a problem FeedBurner and the pipes were clogged up, as it were. Thanks for bringing it to my attention. You might want to scroll back through the blog list to see if you missed some.